On March 2, 2009, the Israeli advocacy group Peace Now issued a report saying that the Israeli housing ministry plans to build 73,000 housing units in the West Bank. Peace Now said 15,000 of these units had already been approved, with another 58,000 awaiting approval. On March 7, 2009, the Guardian reported that a confidential report issued by the EU said Israel continues to annex property in East Jerusalem. It said Israeli housing authorities had submitted plans for 5,500 new housing units (3,000 of which have already been approved) since the Annapolis "peace" conference in November 2007. Readers may recall that the Annapolis conference was supposed to resuscitate George W. Bush's moribund so-called Road Map to Peace. Assuming these housing plans are implemented, and only 2.5 Israelis on average inhabit each new unit, the entire program could add as many as 196,000 Israelis to the 490,000 Israelis already living in the West Bank and East Jerusalem. Yet as recently as September 30, 2008, Israeli Prime Minister Olmert said Israel should withdraw from almost all the Occupied Territories, including East Jerusalem to achieve peace. Of course, Omert's profession of normative behaviour would be deemed gratuitous nonsense in an international court of law, because all these settlements are clearly illegal under the Fourth Geneva Convention. So what gives? Nothing. What you see is what you get -- simply business as usual. There is no real peace process, only an illusion of one, but an illusion that has been and continues to be used cynically by the Israelis to ethnically cleanse the best land for Eretz Israel ("best" by definition includes access to the water in the West Bank aquifers -- more on that later) by relentlessly creating irreversible "facts on the ground." All one has to do is look at the historical record. For the last 20 years, the U.S government and its wholly owned subsidiaries in the think tanks, academia, and the media have promoted the soothing vision of an ongoing Arab-Israeli peace process. This process has been centered on the ideal of attaining a two-state solution -- namely, establishing a Palestinian state in the West Bank and Gaza. Dutifully, the mainstream media in the United States (MSM) has inundated the American people with stories describing how the ongoing peace process is a road leading to a resolution of the Arab-Israeli conflict. But to date, that road has led into the nightmare of the West Bank's road-blocked cantons and the hellish Gaza Ghetto, and the preponderance of MSM reporting, at least in the United States, leans toward blaming the Palestinians for their fate. To be sure, the MSM also reported about bumps in the road that can be attributed to Israel, especially question of settlements in the Occupied Territories. But such reporting has been usually in the context of the settlements being temporary impediments to a solution, often couched, for example, in vague visions of Israel eventually abandoning most of its settlements, and doing land swaps for others, once the Palestinians renounced terrorism and recognized Israel's right to exist. In this context, there have been very few reports that put the question of settlements into an easily understood long term perspective, even though the information is widely available on the internet. To be sure, the Israelis did evacuate 6000+ settlers from Gaza in 2005, and occasionally, the Israeli government evacuates a trivial number of settlers from the so-called "outposts" on the West Bank. But these Israeli moves have been anomalies to their long term pattern of settlement, which has been amazingly consistent since the rate of settlement began to accelerate in the mid 1970s. As demonstrated in the chart below, the pattern of settlement has been remarkably untouched by the deliberations of the so-called peace processes. It is based on official data produced by the Israeli government and made available to the public by the courageous Israeli human rights organization B'TSelem. The so-called peace process, which at first was ad hoc, became institutionalized with great optimism in 1993, when the signing of the Oslo Accords ended the First Intifada. But over the next seven years, the Oslo deliberations did not alleviate the economic hardships afflicting the Palestinians, nor did it even slow down the pace of Israeli settlement, as is shown clearly by the pink shaded area of the figure. Oslo effectively ended in Sept 2000, when Ariel Sharon's provocative visit to the Al Aqsa Mosque in Jerusalem (Islam's third holiest site) incited the Palestinian uprising that became known as the Second Intifada and helped to catapult Sharon into the office of Prime Minister. A re-institutionalization of the formal peace process rose tepidly from the ashes of Oslo in June 2002, with the so-called Road Map to Peace initiated by President George W. Bush. The aim of Bush's Roadmap was to establish an independent Palestinian state as early as 2005, and central to achieving that aim was a freeze on settlement expansion by May 2003 (called for in Phase I of the roadmap), as well as a reduction in violence and political reform by the Palestinians. 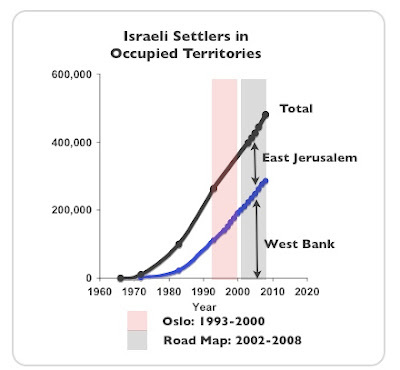 The gray area in the figure spans the time of Bush's so-called road map, and clearly his Roadmap, like Oslo, had absolutely no effect on Israel's pace of settlement. Israel's murderous assault on the Gaza Ghetto effectively dumped the detritus of Mr. Bush's illusion into the lap of incoming President Obama in January 2009. The assault on the Gaza Ghetto, together with a sense of frustration from not being able to weaken Hamas's grip on Gaza, also helped to accelerate an ongoing political shift toward the radical right among the Israeli people, as became evident in the stunning results of the recent Parliamentary election. It now seems likely that Binyamin Netanyahu -- the former prime minister between 1996 and 1999, who worked so assiduously to trash Oslo and increase settlements -- will return to power as prime minister, this time with the neofascist Avigdor Lieberman as his foreign minister. So, based on the history depicted in the chart and Netanyahu's track record, we can expect the rate of settlement in the West Bank and East Jerusalem to continue and probably increase. True to form, in one of his campaign speeches, Netanyahu promised he would not be not bound by Olmert's empty promise to evacuate the settlements, and any future peace talks would not be about giving up territory, but about achieving an "economic peace" through economic development -- whatever that means. And how has Mr. Obama's government reacted to date? The most critical comment I have been able to find is Secretary of State Hillary Clinton's remark in Jerusalem that the planned expansion of the settlements cited in the first paragraph would be "unhelpful." One thing is certain, we can depend on being put to sleep with more somnolent visions of peace in our time while the Israelis create more facts on the ground.